As expected, Tropical Cyclone Keni followed a track similar to Tropical Cyclone Josie and passed to the southwest of Fiji's main island of Viti Levu on April 10, 2018 (UTC). No casualties were reported with Keni even though it was a more powerful tropical cyclone than Josie. Keni was still intensifying when it passed directly over the island of Kadavu located just south of Viti Levu. Flash flooding was reported on Viti Levu and Kadavu. Maximum sustained winds of greater than 70 knots (81 mph) were responsible for widespread damage caused by the direct hit to Kadavu. Keni's peak winds of 85 knots (98 mph) occurred after the tropical cyclone passed to the southeast of Kadavu. Rainfall maps were created at NASA's Goddard Space Flight Center in Greenbelt, using data from various satellites. Integrated Multi-satellitE Retrievals for GPM (IMERG) data are generated by NASA's Precipitation Processing System every half hour within about 6 hours from when data are acquired. The Global Precipitation Measurement mission or GPM core observatory's Microwave Imager (GMI) and Dual Frequency Precipitation Radar (DPR) data are used to calibrate IMERG data. GPM is a joint mission between NASA and the Japan Aerospace Exploration Agency, JAXA. The IMERG accumulated rainfall analysis showed precipitation that fell during the period from April 4 to 11, 2018. During this period tropical cyclone Keni formed east of Vanuatu, intensified to hurricane force west of Fiji and passed to the southwest of Fiji. IMERG data indicated than tropical cyclone Keni's heavy rainfall was less wide spread than heavy rainfall that occurred with tropical cyclone Josie. IMERG data indicated that rainfall totals with Keni were greater than 200 mm (7.9 inches) over the southwestern and northern sides of Viti Levu. Tropical cyclone Josie dumped more than that over the entire island. IMERG data indicated that the maximum rainfall with Keni was located over the waters southwest of Viti Levu where more than 430 mm (16.9 inches) of rainfall was analyzed. 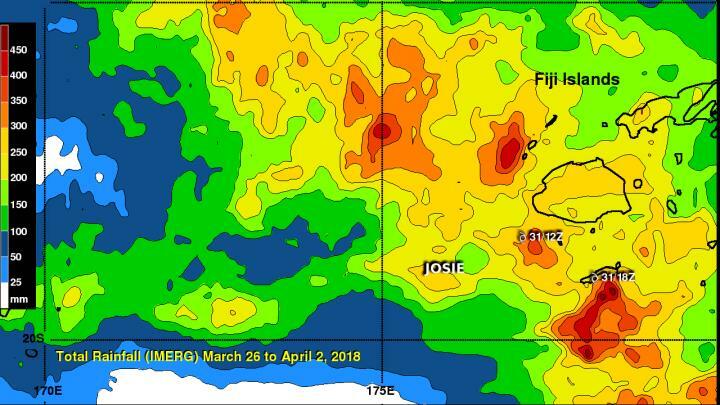 After Tropical Cyclone Josie moved through the region, an IMERG rainfall analysis was completed that covered March 26 to April 2, 2018. During that period, tropical cyclone Josie formed and passed by close to the southwest of Fiji and then to the southeast. IMERG data indicated that rainfall totals of greater than 250 mm (9.8 inches) occurred over large parts of Fiji and extreme rainfall totals greater than 450 mm (17.7 inches) in some areas along the storm's track. Josie is long since dissipated, and Keni's remnants dissipated on April 11 south of Fiji.